In 1911, both Thomas Edward and Thomas William were coal miners, father Thomas being a hewer and son Thomas being a putter. The family lived at Pease Street, known locally as the Square, St. Helen’s Auckland. The service record of 3166 Private T.W. 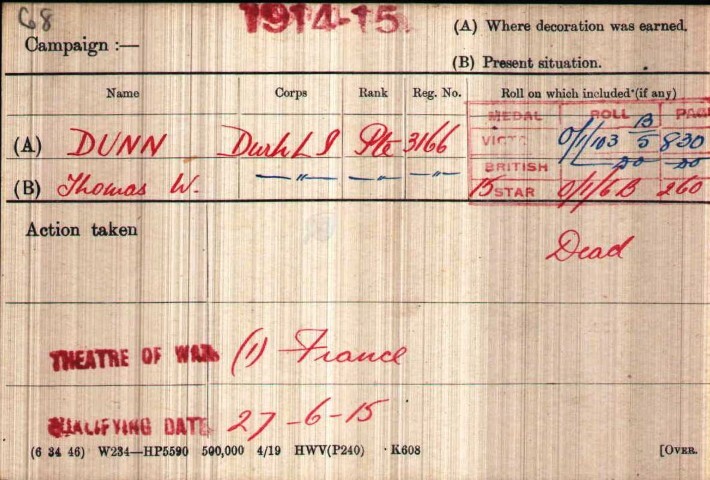 Dunn and the 1/6 DLI Battalion War Diary have not been researched. After taking heavy casualties at the Second Battle of Ypres throughout April and May 1915, the 1/6th and 1/8th Battalions merged to form the 6/8th battalion in June but its original identity was resumed by August 1915. The Division served with distinction on the Western Front throughout the war. Total Allied casualties numbered over 600,000 including 146,000 killed or missing. British and Commonwealth forces lost over 95,000 men. Germany suffered about 450,000 casualties including about 164,000 deaths. 15 September: 149th Brigade (4th Northumberland Fusiliers & 7/NF) and the 150th Brigade (4th East Yorkshires, 4th Green Howards & 5/GH) advanced and took the first objective, Hook Trench by about 7.00am. Little progress was made by the 47th Division which meant that any further progress onto the Starfish Line by the NF battalions would be subject to enfilade fire from machine gun fire in a German strong position in High Wood. NF casualties were severe and 9/DLI from 151 Brigade was called up to support the attack on the Starfish Line. As the attack started, 6/DLI moved from Shelter Wood to the south west corner of Mamtez Wood and then later in the day into the wood itself. Orders were received that 151st Brigade was to attack Prue Trench. 6/DLI and 9/DLI moved into the recently captured Hook Trench. By 7.20am the 149th and 150th Brigades advanced and captured the second objective, Starfish Line, The Bow and Martin Trench but firing from both flanks caused very heavy casualties and the 4/NF were driven back to Hook Trench. Both 5/NF and 6/NF were now involved in the battle. On the left, 150th Brigade experienced heavy fire from the ruins of Martinpuich but the 4/EY reported that their second objective had been reached. By about 10.00am the 150th Brigade reported the capture of their third and final objective and the situation appears to have been 4/EY in Martin Trench, 4/GH and 5/GH holding 30 yards of the extreme left of Prue Trench and about 100 yards of the extreme left of the Starfish Line. The Divisional Front ran in a north-westerly to south-easterly direction between High Wood and Martinpuich. The 149th Brigade met with the greatest opposition. The results of the attack were the occupation of a short portion of Prue Trench and about 100 yards of the Starfish Line nearly as far as The Crescent. By 2.00pm the Divisional Line ran from the eastern end of Hook Trench, The Bow, part of Crescent Alley, Martin Trench, Prue Trench and Starfish Line, west of Crescent Alley to Martin Alley. The 151st Brigade was on the right and the 150th Brigade was on the left. At 8.20pm 5/DLI was ordered to make another attack on the Starfish Line and Prue Trench but it was not until noon on the 17th that anything was known of the result. 17 September: 6/DLI was scattered across the battlefield and Lieutenant-Colonel Jeffreys attempted to recall various units as far as was possible. By morning he had the following under his control – half of W Company under Capt. Cook, part of X Company under Lieut. Harris, a platoon of Z Company under Lieut. Hansell. Y Company was in reserve in a sunken road under 2nd Lieuts. McVicker and Richardson. Isolated groups lay out in front. 5/BR remained in The Bow. 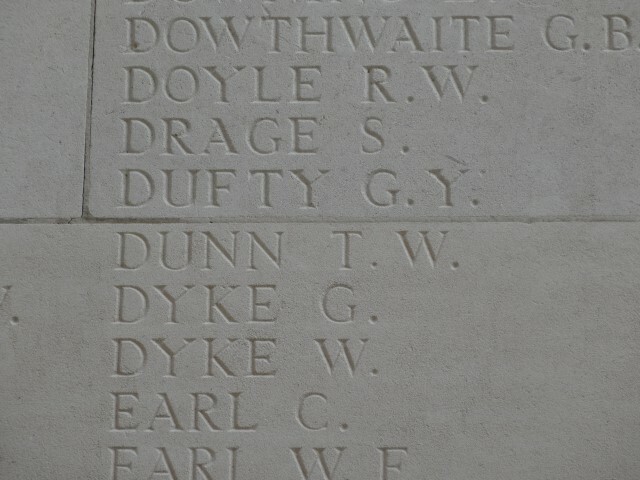 During the evening, orders were received to capture Prue Trench at 5.50am on the 18th. 18 September: Heavy machine gun fire broke up attacks. Twice 8/DLI tried to reach The Crescent. Heavy rain had fallen all day and mud proved to be an impassable obstacle. Even ration parties had difficulty getting food up to the half-starved men. No fires could be lit. 9/DLI was relieved and returned to Clark’s Trench. 19 September: 6/DLI back in Sixth Avenue, Intermediate Trench and Jutland spent the day repairing trenches and salvage work. 20 September: 8/DLI held practically the whole line from The Bow to Martin Trench standing in 2½ feet in mud. During the evening, 151st Brigade was relieved by the 149th and moved back to Mametz Wood. The total number of casualties suffered by the 151st Brigade from the 15th to the 20th September was 43 officers and 903 other ranks. 9/DLI lost 44% of the Battalion’s strength which went into action. 21 September: Information had been received that the enemy had retired and the 6/NF and 7/NF occupied both Starfish and Prue Lines without opposition. Total: 34 officers and 1005 other ranks. 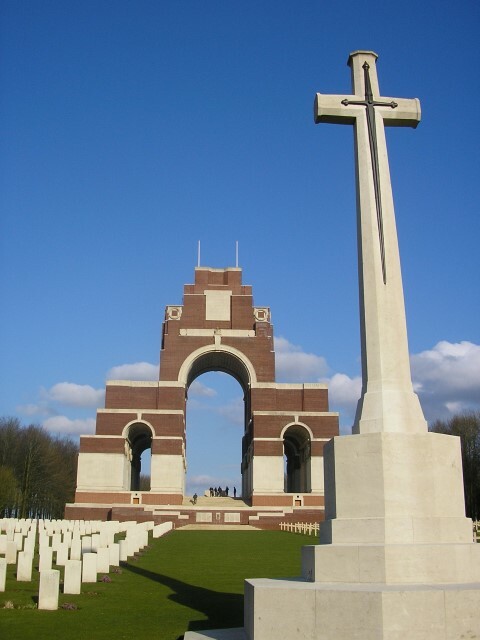 The most severe casualties were suffered on 15 September 1916 when the Northumberland Fusiliers lost 375 men including 4/NF losing 5 officers and 189 other ranks, 6/NF losing 1 officer and 71 other ranks and 7/NF losing 3 officers and 88 other ranks. Objectives achieved, the fighting moved on to the Battles of Morval (25 – 28 September) and Le Transloy (1 – 18 October). Horrendous casualties were suffered by the 50th Division at the Butte de Warlencourt, 5 November before the Somme offensive was called off as winter closed in.